Bringing much-needed principles and ethics into perspective, the book counsels its readers to uncomplicated situations. According to the book, hard-learnt lessons should not be ignored for momentary pleasures. The first edition of Daily Inspiration was published by Jaico Publishing House in 2007. It is available in paperback format. The one-day-a-quote pattern method helps in better understanding. These quotes urges one to look beyond monotony and serve as self-realization material. Robin Sharma is one of the world's most highly respected leadership experts. He is devoted to the mission of helping organizations develop people who Lead Without a Title so that they win in this period of intense change. His clients include Microsoft, GE, FedEx, IBM, Nike, NASA, Yale University and The Young Presidents Organization. 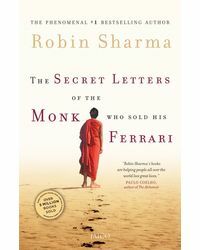 Sharma's books, such as The Monk Who Sold his Ferrari and The Greatness Guide, have topped best-seller lists across the globe and have sold millions of copies in more than seventy languages. They have been embraced by rock stars, royalty and many celebrity CEOs. 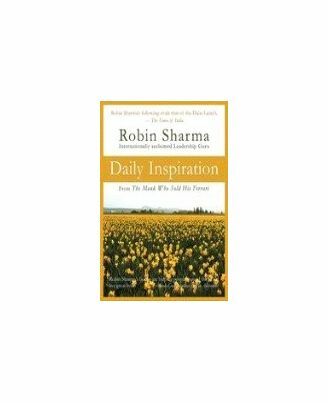 About the Book: Daily Inspiration, written by Robin Sharma, is an extensive, heartfelt collection of quotes borrowed from his bestseller, The Monk Who Sold His Ferrari and some of his other writings as well. These quotes inspire you into looking at the larger picture in life. Being a virtual calendar of sorts, the author advises the readers to go through the book in a one-day-a-quote pattern. This book offers a fresh perspective on worldly actions and helps readers in understanding the underlying essence of existence and survival. The book urges people to self-evaluate so that they can grasp the innate purpose of their lives. Furthermore, it stresses on learning to think beyond the monotony of daily life. It advises readers to look at each day in a positive light and as an opportunity for learning new things. Motivating readers to achieve a fine balance between professional and personal lives, the quotes in this book help individuals in becoming better human beings. Bringing much-needed principles and ethics into perspective, the book counsels its readers to uncomplicated situations. According to the book, hard-learnt lessons should not be ignored for momentary pleasures. The first edition of Daily Inspiration was published by Jaico Publishing House in 2007. It is available in paperback format. Key Features: The one-day-a-quote pattern method helps in better understanding. These quotes urges one to look beyond monotony and serve as self-realization material. Various aspects life mentioned in these quotes are relatable for several age-groups About the Author : Robin Sharma is one of the world's most highly respected leadership experts. He is devoted to the mission of helping organizations develop people who Lead Without a Title so that they win in this period of intense change. His clients include Microsoft, GE, FedEx, IBM, Nike, NASA, Yale University and The Young Presidents Organization. 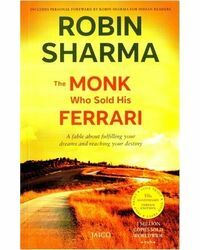 Sharma's books, such as The Monk Who Sold his Ferrari and The Greatness Guide, have topped best-seller lists across the globe and have sold millions of copies in more than seventy languages. They have been embraced by rock stars, royalty and many celebrity CEOs.